A Facebook user, Ibrahim Abbas, has shared a totally heartbreaking message on his page. HOW NIGERIAN POLICE BULLETS BLEW OFF MY BABY'S BRAINS! 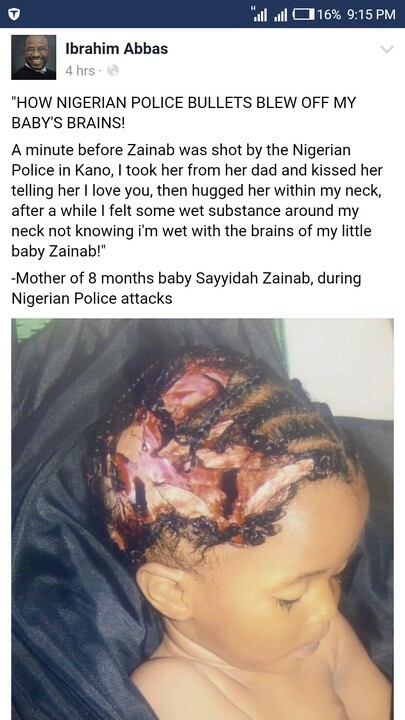 A minute before Zainab was shot by the Nigerian Police in Kano, I took her from her dad and kissed her telling her I love you, then hugged her within my neck, after a while I felt some wet substance around my neck not knowing i'm wet with the brains of my little baby Zainab!" -Mother of 8 months baby Sayyidah Zainab, during Nigerian Police attacks"